Did you ever have one of those days where you work and work and work, and when you’re finished you have nothing to show for it? That was sewing yesterday. Jeanne of Grey Cat Quilts came over and we worked on a couple of samplers. When we stopped for lunch Jeanne discovered that her block – the third or fourth attempt of the same block – was once again too big. 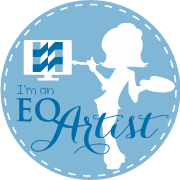 She eventually figured out the problem – a 5 grid block that needed to finish at 12″ caused for some wonky rounding in the EQ measurements – but it was too late. That block is forever destroyed for her, and now she’s looking for a replacement block. 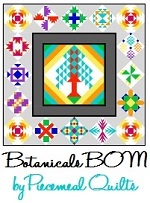 Since it’s for her Botanical BOM quilt, that means she had to find another block with a plant name, which is more challenging than you’d think. 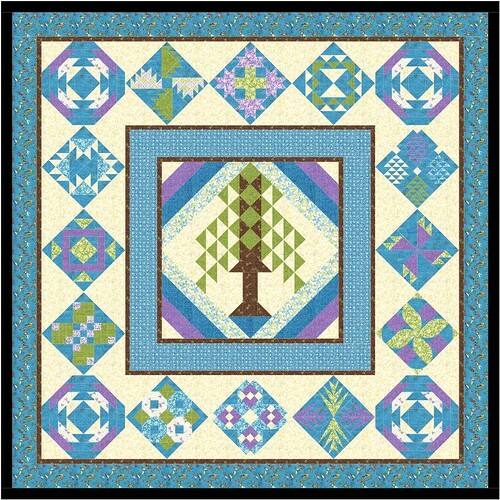 Sue’s layout – great for a newer quilter because it has background fabric sewn around the blocks, then trimmed to make them tilt. 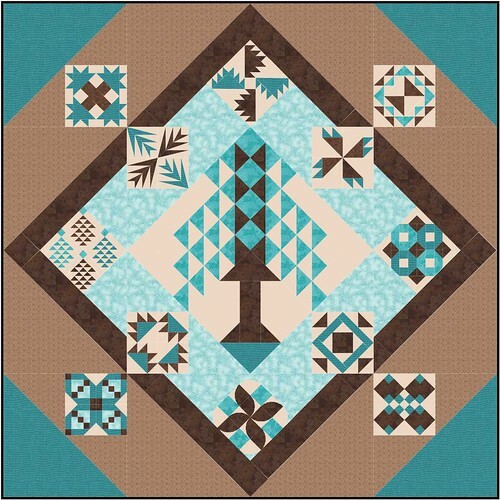 Mom’s layout in one colorway. She’s making two quilts, because she’s an overachiever and she couldn’t decide which colorway she liked best. 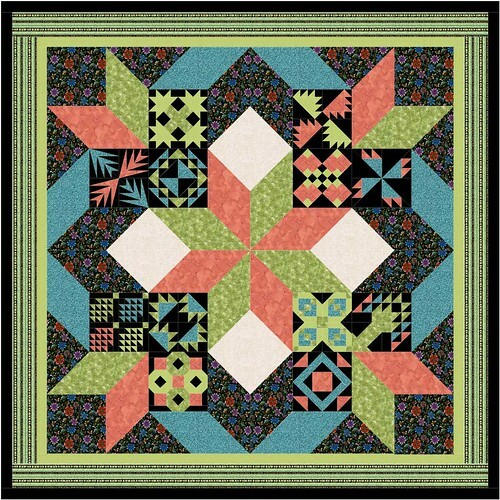 My aunt Jean’s layout and colorway. We were surprised how much we liked the black background in the blocks. 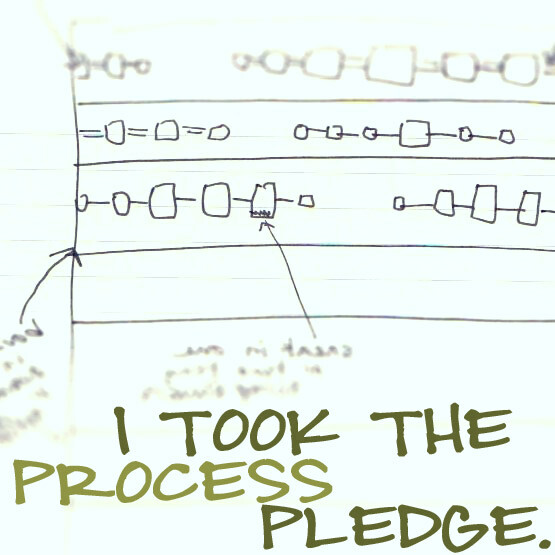 Whoa – got a bit off track there! While Jeanne was fighting with her block, I was wasting time. I do that. I was checking things online, talking about really cool upcoming stuff that you’ll see here in the next couple of weeks (ooh, foreshadowing! ), and ranting about politics. This blog is a politics free zone, so no details. 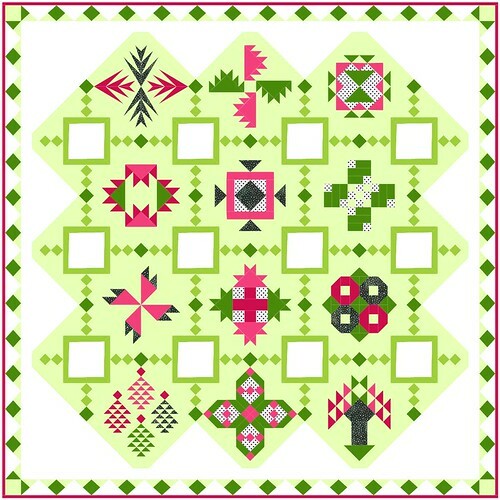 I also packed away a few WIPs to make room so I could – finally – work on the Test Your Skills Sampler. 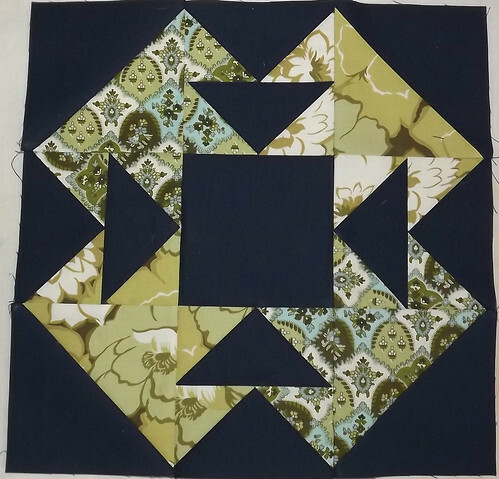 I’m a bit behind on the blocks, so I made the Capital T. I finally settled in to sewing, and it was a little too quiet there for a while. Except for Buttercup’s snoring. I had just sewn the flying geese units into pairs when I realized I’d done it wrong – they were supposed to have different color “sky” fabrics on each side, and I’d made them the same. Rather than take them apart and switch the pieces around, I made eight new flying geese. When Jeanne had to leave I’d just finished sewing the last pair of geese together. And then I took a break. I know! 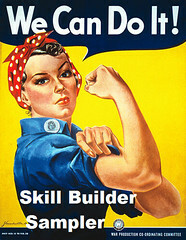 All I had to do was sew the nine sections together – basically a nine patch – and it would have been finished! That’s my problem – I lose steam and go off to find something else shiny to play with. I did finish it last night before going to bed, but really – a sewing DAY, and I finished a single block?! Ah, well. At least it’s progress. I really like all the colours for the botonical BOM, especially your Mom’s with the black. These blocks look challenging and fun. oops it was your Aunt’s but Mom’s is great too. I think your bocks look really different and I love all the different layouts. I have one BOM almost done so I could add another. More progress than I’ve made in most days lately! I’m hoping this week will be better! 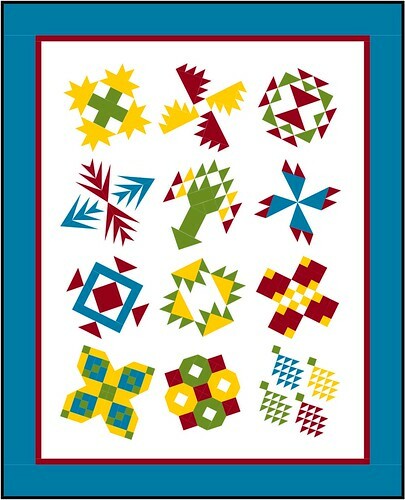 It was interesting seeing all the different layouts an colours of the quilts.